Vancouver Island is an island off the southwest coast of British Columbia, Canada. Even though it shares the name "Vancouver" with the city of Vancouver, BC, (they were both named after English naval explorer Captain George Vancouver), they are two different places. Let's start with the most famous Vancouver Island destination: Victoria, BC. Victoria is the largest city on Vancouver Island and the capital of the province of British Columbia. It's also one of the oldest cities in the Pacific Northwest, having been first settled by the British in 1843. Of course, it was home to Coast Salish First Nations people for hundreds of years before that. Travelers can easily spend two or three days exploring Victoria. Major attractions include the world-famous Butchart Gardens, the Inner Harbour--where you can visit Fisherman's Wharf, tour the Parliament Buildings for free, and have Afternoon Tea at the Empress Hotel--and Fort Street shopping and antiquing. Victoria is also an access point for whale watching tours (see below) and other outdoor adventures. Tofino, BC is, arguably, Vancouver Island's most "up and coming" destination. 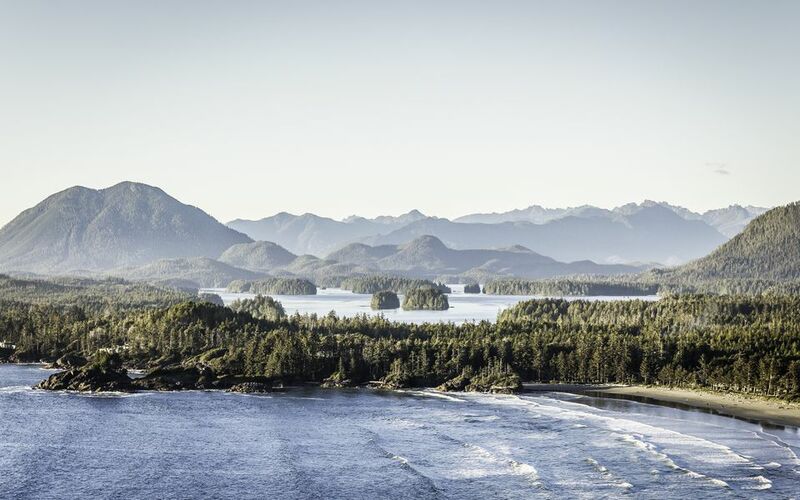 By which we mean Tofino has been a beloved vacation destination for Vancouverites and locals for generations, but, in the last decade or so, has begun to attract visitors from around the world. There are two (metaphorical) sides to Tofino. On one, Tofino is a traditional Pacific Northwest nature destination: People visit for the rustic beaches and untouched forests, for whale watching, storm watching, bird watching, and surfing. It's a popular destination for camping, hiking, kayaking, and canoeing. On the other side, Tofino has a growing reputation for luxury accommodations. The Wickaninnish Inn, one of the top romantic getaways from Vancouver, epitomizes this, artfully combining breathtaking geography with high-end spa packages. You can even stay in ultra-swanky luxury tents (yes, tents!) at the Clayoquot Wilderness Resort. Style tip: For the most stylish trip to Vancouver and Vancouver Island, stay at the Opus Hotel in Vancouver, shop and dine in Gastown, then take a plane to Tofino and relax in splendor at the Wickannish Inn! Vancouver Island is one of the top destinations for whale-watching in all of North America. During whale migrations, you can see orcas (killer whales) and grey whales, and (less frequently) humpback and minke whales. For orcas, the whale-watching season typically runs from May - November, coinciding with salmon migration, which attracts the orcas. For grey whales, who are migrating north to the Bering Sea, the prime whale-viewing season starts in March, heralded by the Pacific Rim Whale Festival in Tofino. Victoria, BC - Tours from Victoria include Eagle Wing Tours and Prince of Whales. Tofino, BC - Tours from Tofino include Jamie's Whaling Station and West Coast Aquatic Safaris. Big, big, BIG trees. That's what you'll find at Cathedral Grove, an ancient forest where the biggest trees are 800 years old, 75 m (250 ft) tall and 9 m (29 ft) in circumference. Located in MacMillan Provincial Park in the center of Vancouver Island (so you will need a car to reach it), Cathedral Grove offers the unique opportunity to see and get close to the grandest Douglas Fir trees in all of British Columbia. Cathedral Grove is about 2.5 hours by car from Victoria and about 2 hours by car from Tofino. Ever heard of Nanaimo Bars? The popular Canadian dessert--a three layer bar made of a crumble-wafer bottom, custard-flavor butter icing middle, and chocolate top--gets its name from Nanaimo, BC, a city on the east coast of Vancouver Island. Nanaimo has plenty of natural attractions, including scuba diving and snorkeling with seals, and the gorgeous Englishman River Falls Provincial Park. But it's included here for foodies with a sweet tooth: In Nanaimo, you can do the Nanaimo Bar Trail, a multi-stop Nanaimo bar tour that lets you taste the delicacy all over town! Like Victoria, Nanaimo is also a good "jumping off" point for the entire island. BC Ferries run directly to/from Nanaimo, and it has its own airport, too. Located about 30 minutes (by car) north of Nanaimo, BC, Parksville / Qualicum Beach is a cozy, safe, family-friendly beach town with loads of charm, swimmable lakes and rivers, multiple golf courses, and plenty of hiking trails. The area is, of course, best known for its beaches in Rathtrevor Beach Provincial Park; these soft, sandy beaches are among the best beaches near Vancouver. While there are several family-friendly resorts along Rathtrevor Beach, RVing and camping are super popular here, with picturesque campgrounds and RV parks all around the coast. One example is Cedar Grove, an RV park, and campground that's just a short walk from Qualicum Beach. The two main attractions in Cowichan are the farmers' markets--famed for both their local produce and home-made artisanal products--and the abundant wineries that dapple the valley. In fact, Cowichan Valley is the second-largest wine producing region in British Columbia (first is the Okanagan)! There are 15 wineries in Cowichan with tasting rooms, offering everything from traditional varietals like Pinot Noir, Pinot Gris, Gewürztraminer, and Ortega to local sparkling wines and fruit wines. You can bring a car and do your own wine tour, or sign up for a formal wine tour (complete with designated driver). Snow sports season typically runs from late-November through late-February. Mount Washington Alpine Resort offers alpine and Nordic skiing, snowboarding, and snow tubing. Vancouver Island is in Canada. Which means, if you are traveling to Vancouver Island from another country (including the United States), you must have the correct travel documents, including a valid passport and (if required) visa. Take a BC Ferry to/from Vancouver, BC to Victoria or Nanaimo on Vancouver Island. These ferries do carry cars, so you can bring a car over, or you can use public transit to reach the ferry, then walk on. Remember: You can rent a car on the island. Take a float plane or small aircraft (including helijet) from Vancouver (or Seattle) to Victoria, Nanaimo, or Comox. Fly commercial airlines into/out of Victoria International Airport (YYJ) and Vancouver International Airport (YVR).